2) Fitting In order for your ramp to meet NRCS guidelines, it needs to: 1) fit snug against the sidewall and 2) sit flat on the bottom. If you think you'll have any gaps, we'll be glad to give you some extra mesh. 4) Add Weight Inside Please remember to add a brick or rock to the inside of the ramp. It will help stabilize the ramp and give it some mass. Plus, polyethylene is slightly buoyant. 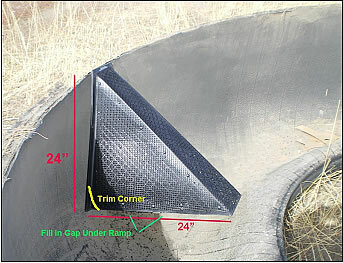 20" & 22" ramps are the most popular size for tires troughs. Installing in a tire requires a little planning. This will give you a better ramp fit with less trimming. We'll gladly give you some extra mesh to fill in any gaps. 1) Try to Minimize the Gap on the Bottom You will probably have a gap underneath the ramp because the nose of the ramp will hit the center core of the tire. Rather than cutting the nose off the ramp, it's usually easier to fill the gap under the ramp as explained below. 2) Trim to Reduce Side Wall Gap In most tires you will only need to trim the back/bottom corner. 3) Fill Bottom Gap Fill any bottom gap with a solid material. Use: Cement brick or blocks are easiest. Or you can pour a cement base or use 1/4" galvanized mesh and wrap it around rocks. 4) Fasten Ramp Fasten ramp to tire with bolts or screws (use with washers) You can use also use angle iron or aluminum straps. 5) Place Weight Inside Ramp To stabilize ramp, add weight inside ramp. Brick or rocks work well. Polyethylene is slightly buoyant and must have added weight.